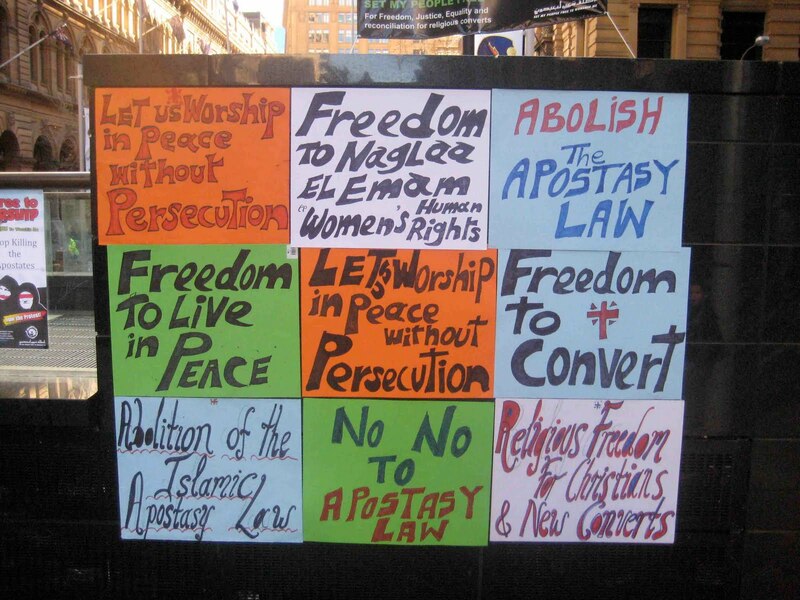 At noon, on Saturday August 28, 2010, a crowd of a few hundred people gathered at Martin Place, in Sydney, to protest against Islam's apostasy law. This law, based upon the example of Muhammad and the teachings of the Qur'an, declares that a man who leaves Islam should be killed. For female apostates Islam's legal schools differ: some say the penalty is death, while others stipulate confinement of the apostate for as long as they live, or until they revert to Islam. I was one of the speakers, and my speech has been broadcast in a two-part YouTube video. Richard Fernandez was one of those present in the crowd, and has blogged on the event in his post entitled The Age of Apostasy. 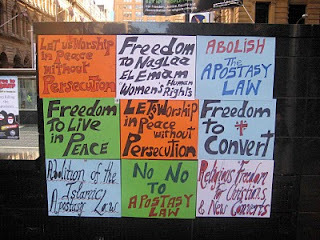 See also my blog post on Islamic apostasy fatwas, which was posted to my Common Word Blog in February 2008. Brilliant Mark, well done to you! Let us ALL stand up with the courage and the conviction of our friend Mark Durie who's balanced view behooves each of us stand our ground for the sake of freedom and the rights of our dear friends from the Islamic world. I recently attended a breakfast meeting with key politicians who were there to hear the views of a noted historian and expert on matters Middle East and he spoke on the subject of Islamic Extremism. He deemed the problem as non-religious and skirted around the core issues, without providing the focus and the passion that Mark provides, and never once focussed on the "human element" and the pressures these dear folk are up against in their own nations. It's not an ethereal thing to state that us showing God's love to these ones will go a long way towards trust and mutual respect being built. I declare that indeed this IS a religious issue at its core and I also declare that God knows just how to solve it.